My friend Matt, who found me through my various HP support sites that I set up for the products that I helped to design when I worked at HP, contacted me a few months ago and asked if I’d be interested in working with him on a new backup product that he had invented. He needed some help in getting the software developed as well as finding a hardware partner to help bring it to market. I thought I’d be able to provide some assistance and so I agreed to help him. The product that resulted from this effort is called Picture Keeper and it’s the simplest way I’ve found to safeguard your irreplaceable digital pictures. Matt does computer support as a sideline and he noticed that as people began replacing their film cameras with digital cameras they were not backing up their digital images. They’d download images from their digital camera to their PCs and then just let them sit on their hard drive without a backup. My own involvement with supporting the HP Media Vault also made me aware of a disturbing trend. Although we had designed the Media Vault as a backup device, customers were taking data from their PCs, moving it to the Media Vault and then deleting every other copy of it to ‘free up space’ on their PC’s hard drive. It’s hard to overemphasize how wrong that approach is, yet I periodically get panicked emails from people who moved all their data to a single hard drive and then need help to retrieve it after the hard drive crashed. Storing your data all in one location is dangerous even if it is on a RAID device, since if there’s some glitch on a drive that corrupts the data, the corruption could be copied to the redundant disk, which makes the data impossible to retrieve. You should always have two or more copies of your important data, preferably in separate locations. Of all the data you can lose from your hard drive, the most heart wrenching files to lose are your digital pictures. People will run from a burning house and forgo grabbing their valuables and take their photo collections instead. Virtually every other possession in a home is replaceable or insured, but photos are not. As good as the HP Media Vault is at protecting data, it’s not a panacea. For example, if your house is burglarized, your PC and Media Vault may get stolen. Also, if you have a fire or flood, a hard drive will be unlikely to survive. Quite simply, you need a device that stores the photos and can easily be taken off site or put in a location that is safeguarded from fire, theft, or flood. Of course, you can use optical media for this purpose, but it’s a pain to set up and run periodic backup jobs to optical media and so it doesn’t get done. It’s also impractical to make incremental backups on optical media and so people tend to just make periodic full backups which are time consuming and wasteful since you end up with old media that needs to be securely destroyed and replaced with a whole new set of optical media. That’s very wasteful and harmful to the environment. Writing to optical media generally also requires special software to be installed on each computer. Now that USB flash memory devices are becoming available in sizes that can hold a complete digital photo collection, they are a perfect solution for backing up digital pictures. Flash memory is very compact, has no moving parts, and doesn’t suffer from degradation like tape and optical media. It also can survive a run through the washer and dryer cycle, an experiment that both Matt and I have inadvertently run several times. I know that Internet ‘cloud storage’ is all the rage now but it requires a perpetual monthly fee. If it doesn’t require a monthly fee, then it’s probably not a viable long term business. If an on-line backup service shuts down or if you forget your user password, your data is gone forever. So there is a very good reason for storing your data on a small, secure, portable device that you control. No one is very excited about installing and learning yet another software product to make periodic backups. But with the Picture Keeper, that’s not a problem. The software to find all of your pictures and back them up is included on the device and requires absolutely no installation. It works both on Windows PCs (XP and Vista) and Macs (OS X). When you plug it in, a pop-up screen comes up and lets you launch the program directly from the device. It will scour your hard drive for your digital pictures and then safely store them on the device. If you add more digital pictures to the PC, you can just repeat the procedure and it won’t have to re-save previously backed-up files because it knows which ones are new, which ones have changed, and which ones have already been securely saved. 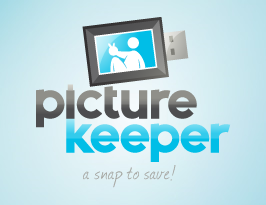 Although it’s set up by default to safeguard your digital pictures, Picture Keeper has a lot of flexibility that allows you to customize the backup job so that it can look at alternate folders for your images, or even backup other file types besides jpeg (.jpg) images. You can use Picture Keeper on multiple computers and it will keep the photos in separate folders based on the computer they came from. That’s an important feature for those of us who tend to have photos spread across multiple computers. If this sounds like a product you need or perhaps know someone for whom it would make the perfect gift, head on over to Picture Keeper and use the code ‘lee10’ for a $10 discount. And please don’t hesitate to contact me if you have any questions about it. This entry was posted in entrepreneur, technology by Lee Devlin. Bookmark the permalink.